Here’s another case of a top company that sees safe streets for biking as talent recruitment tool. One of America’s largest retailers is chipping in to make cycling more appealing at its new headquarters in downtown Seattle. Online giant Amazon will pay for the construction of a protected bike lane on Seventh Street along the two-block stretch by its new 3.3 million-square foot office complex. The agreement was negotiated by the city of Seattle in exchange for turning over some public alleyways within the development to the company. Amazon will also pay $250,000 to help study extending the protected bike lane to Pine Street. 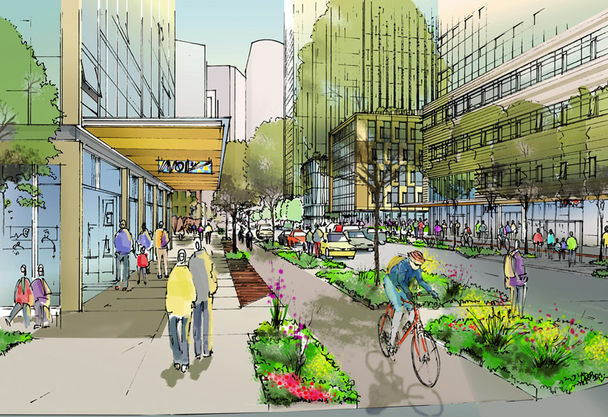 The Seattle Times writes that Amazon is “raising the stakes for what companies can do to encourage bicycle commuting.” Amazon will also include 400 stalls for bike parking in each of its three towers, the Times reports. That is about triple the city’s minimum requirement. John Schoettler, Amazon director of global real estate and facilities, told the Times the company is excited to be part of the improvement. “Cyclists are part of the fabric of Seattle, and so we’re thrilled to be creating a new cycle track that will make the ride to and from downtown safer and easier for all cyclists in the community,” he said. The city of Seattle aims to build 100 miles of protected bike lanes. Currently it has only one mile, but more are under construction. The upgrades to the Seventh Avenue bike lane will serve as a demonstration project. The protected lane will be separated from traffic by a row of trees, according to the Times. This type of public-private partnership on sustainable transportation projects — where the private sector partner is a company that chips in without making a loan — is not without precedent, and is becoming something of a trend. New Balance is funding the construction of a new $16 million commuter rail station near its headquarters in Boston. And Apple helped fund the renovation of a Chicago train station. I wonder if Amazon here in Grand Forks would be interested in the same thing. Awesome to see somebody take initiative. Yet really sad that government can’t take leadership on what clearly is the future. I believe that all new highway projects should be funded only by private donations. A 2-block protected bike line, alone, is not really effective. It is like a highway stub that is unconnected with the rest of the network. They need to build a network of protected bike lanes for it to work. Yet, it is better to start providing the infrastructure now than leaving the street without it. There is more than one mile built of “protected bike lanes”, however. The Alki trail along the beach in West Seattle is 1.8 miles of cycle track, connected to annother 3.4 miles of multi-use path. “Recruitment tool”? Wow, what an incredibly bad model for urban development: Companies pay less taxes than they should or simply avoid certain taxes, then legally annex public space and build tiny little stretches of infrastructure in an attempt to bikewash their bad labor practices. Why can’t we have a sugar daddy like Amazon in Cleveland for the Lorain cycle track?